Part 2: The story of how Wall Street’s giants got around derivatives rules imposed by the CFTC after the financial crisis. The fix: tweaking contracts and shifting deals offshore. NEW YORK – This spring, traders and analysts working deep in the global swaps markets began picking up peculiar readings: Hundreds of billions of dollars of trades by U.S. banks had seemingly vanished. The trades hadn’t really disappeared. Instead, the major banks had tweaked a few key words in swaps contracts and shifted some other trades to affiliates in London, where regulations are far more lenient. Those affiliates remain largely outside the jurisdiction of U.S. regulators, thanks to a loophole in swaps rules that banks successfully won from the Commodity Futures Trading Commission in 2013. The products affected by that loophole include some of the most widely traded financial derivatives in the world – such as interest rate swaps, where a bank takes a fee for exchanging a variable-rate interest payment for a fixed rate with a client, and credit default swaps, a sort of insurance where one party, often a bank, agrees to pay another party in the event of a bond default. For large investors, the products are an important tool to hedge risk. But in times of crisis, they can turn toxic. In 2008, some of these instruments helped topple major financial institutions, crashing the U.S. economy and leading to government bailouts. After the crisis, Congress and regulators sought to rein in this risk, and the banks fought back. From 2010 to 2013, when the CFTC was drafting new rules, representatives of the five largest U.S. banks met with the regulator more than 300 times, according to CFTC records. Goldman Sachs attended at least 160 of those meetings. 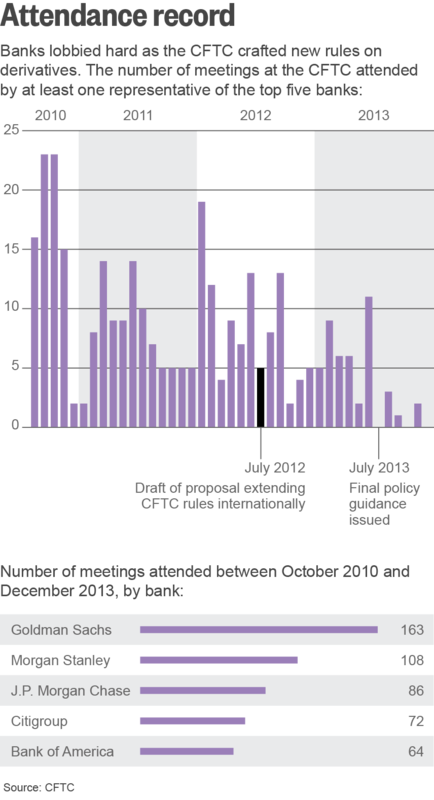 Many of the CFTC employees who were lobbied in these meetings went on to work for banks. Between 2010 and 2013, there were 50 CFTC staffers who met with the top five U.S. banks 10 or more times. Of those 50 staffers, at least 25 now work for the big five or other top swaps-dealing banks, or for law firms and lobbyists representing these banks. The lobbying blitz helped win a ruling from the CFTC that left U.S. banks’ overseas operations largely outside the jurisdiction of U.S. regulators. 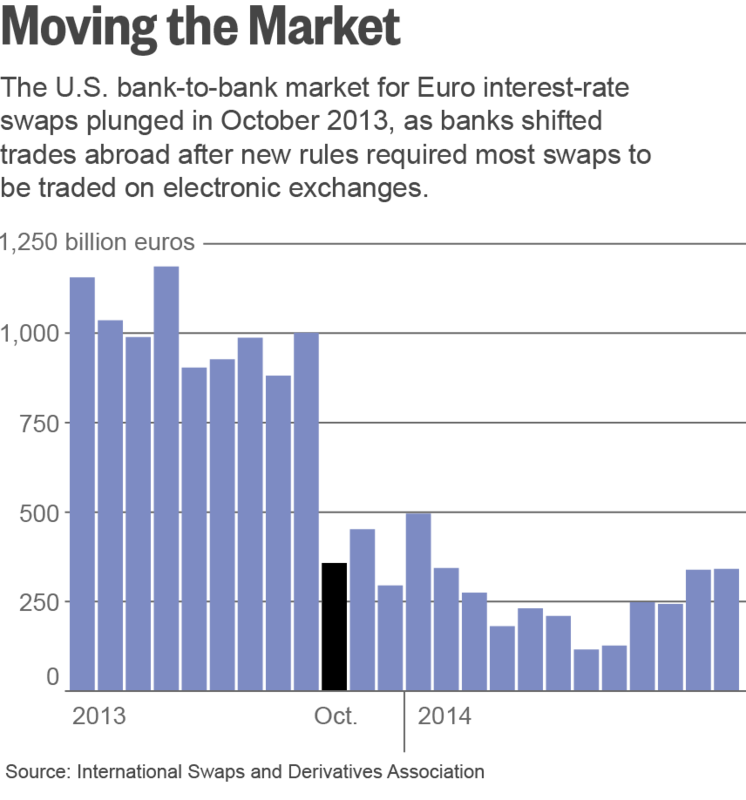 After that rule passed, U.S. banks simply shipped more trades overseas. By December of 2014, certain U.S. swaps markets had seen 95 percent of their trading volume disappear in less than two years. While many swaps trades are now booked abroad, some people in the markets believe the risk remains firmly on U.S. shores. They say the big American banks are still on the hook for swaps they’re parking offshore with subsidiaries. This worries some regulators, who fear that Washington, in turn, will be on the hook for another bailout if these “too big to fail” banks are hit by a fresh shock – such as a rash of defaults in a recession. “These are the shadows that do you in during a crisis, when there is almost always that link back to the core money center banks at home,” said Simon Johnson, an adviser to the Federal Deposit Insurance Corporation, which regulates government insured banks, and a former chief economist at the IMF. To be sure, some post-crisis regulations have reduced certain kinds of risk-taking by major institutions, regulators and lawmakers say. Certain CFTC rules still apply to U.S. banks’ operations abroad, such as requirements that swaps trades be reported to a central data center. Other regulators, such as the Federal Reserve, have jurisdiction over U.S. banks’ global operations. Still, the banks’ victory on the swaps loophole leaves a concentrated knot of risk at the heart of the financial system. The U.S. derivatives market has shrunk but remains large, with outstanding contracts worth $220 trillion at face value. And the top five top banks account for 92 percent of that. In late 2010, the CFTC began drafting new rules regulating derivatives markets as mandated by Congress in the landmark Dodd-Frank Wall Street Reform Act. Lawmakers were doing an about-face: In 2000, Congress had passed a law barring the regulation of derivatives. But times had changed. The notional value of derivatives holdings on banks’ balance sheets had ballooned from $88 trillion globally in 1999 to $672 trillion in 2008, when the financial crisis hit. Those barely regulated products, including certain types of swaps, brought many giant financial institutions to their knees. The Dodd-Frank Act required better reporting and record keeping to keep tabs on risk, and it implemented trading rules aimed at minimizing the chance that a collapsing bank would bring down others. The most commonly used swaps were required to be traded on an electronic exchange open to all buyers and sellers, much like the stock market is today. The rules would make it easier for new competitors to enter the swaps-dealing market, worth an estimated $40 billion to $60 billion a year to the 16 large global banks that dominate the market. Fees would fall – and most important to regulators worried about another meltdown, risk would be dispersed among more institutions. 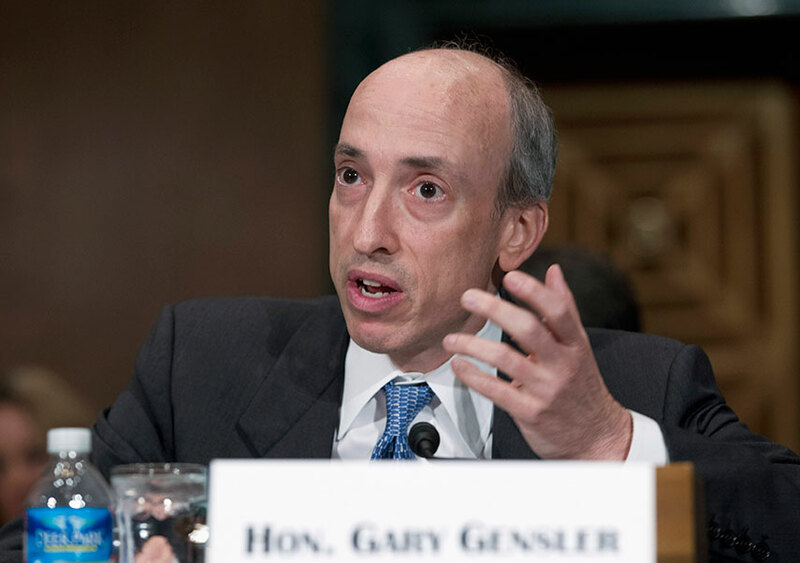 In 2009, President Barack Obama tapped Gary Gensler, then 51 years old, to chair the CFTC. Liberals grumbled about Gensler’s résumé. The son of a cigarette and pinball-machine salesman in working class Baltimore, Gensler, at 30, had become the youngest banker ever to make partner at Goldman Sachs. Among other jobs, he oversaw the bank’s derivatives trading in Asia. Later, as an undersecretary of the Treasury, Gensler helped push through the 2000 law that had banned regulation of derivatives markets. But he had an insider’s knowledge. At Goldman, he had seen how U.S. banks took advantage of differences in regulations in different countries. London, for example, increased its appeal as a global finance hub, in part, by touting its “light touch” regulation to woo banks. That practice – known as regulatory arbitrage – had a history of landing the economy in trouble. AIG, a Connecticut-based insurance giant, buckled in 2008 under trades made by its office in London. U.S. taxpayers footed the bill with a $182 billion bailout. Gensler often told people how, at the Treasury, he was stuck with the task of briefing then-Treasury Secretary Robert Rubin about Long-Term Capital Management in 1998. The Connecticut hedge fund collapsed under $1.2 trillion in swaps booked to a post office box in the Cayman Islands. 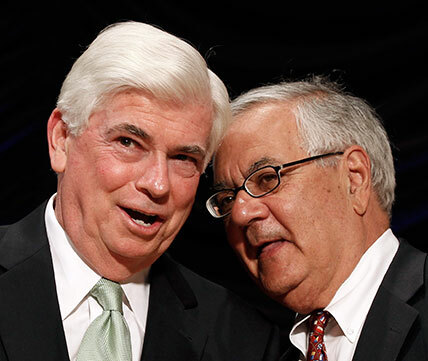 In 2009, soon after Gensler took the job, Congress was hashing out the Dodd-Frank bill. A powerful Republican congressman, Rep. Spencer Bachus of Alabama, put forth an amendment that would keep banks’ overseas operations outside the new rules. Alarmed, the Democratic co-sponsor of the bill, Rep. Barney Frank, asked Gensler to craft a counter-proposal. Gensler and his staff tucked a 17-word insert into a 228-page amendment to the Dodd-Frank bill. The addition seemed to assure banks that the new derivatives rules wouldn’t apply to their overseas trading operations. Bachus backed off. But the insert was craftily worded to leave wiggle room. If those activities “have a direct and significant connection with activities in, or effect on, commerce of the United States,” then the rules would apply, Gensler’s addition read. One year later, at a late 2010 meeting of the CFTC’s board, one of Gensler’s legal aides declared that the passage in fact gave the regulator worldwide reach over U.S. banks’ trading operations. A coalition of 13 global banks banded together to fight the clause. They hired Edward J. Rosen, a derivatives lawyer with Cleary Gottlieb Steen & Hamilton, to lead the effort. The debate that ensued became one of the most contentious chapters of the post-crisis regulatory battle. “The industry ran to the ramparts once it became clear how the CFTC would apply this provision,” said Dennis Kelleher, president of Better Markets, a Washington D.C.-based advocacy group for tighter financial regulation. On weekly conference calls, Rosen and the banks hashed out strategy to shape the new rules. In scores of letters and hundreds of meetings with regulators and politicians, they warned that the CFTC’s proposal would cripple banks’ ability to compete internationally. The proposal was “unworkable and would give rise to a number of significant problems,” warned Rosen in an August 2012 letter to the CFTC. Goldman Sachs Managing Director R. Martin Chavez put it more bluntly in an August 2012 letter to the Commission. The CFTC had “failed without justification,” he wrote. In late 2011, banks caught a break. Michael Dunn, the third Democrat on the five-person commission, stepped down. Dunn’s vote had ensured that Gensler was able to carry the day on controversial rules, outgunning the two Republicans, who tended to vote for bank-friendly regulations. In his place, Obama nominated a long time aide to Democratic Senator Harry Reid, Mark Wetjen. Gensler and other pro-reform allies assumed that the veteran Democrat would vote with the Democrats on the commission. Wetjen, a derivatives newcomer, was not a conventional liberal. He came with an endorsement from the U.S. Chamber of Commerce, an opponent of the Dodd-Frank Act. As his policy adviser, Wetjen hired Scott Reinhart, former in-house counsel at the structured credit products division at Lehman Brothers – the bank whose collapse in 2008 set off the financial crisis. Rosen, the banks’ lead lawyer, discussed Wetjen often on calls with his bank clients. The newcomer, Rosen told them, was key to swinging the commission in the banks’ favor. Banks got dramatically more face time with commissioners after Wetjen’s appointment. In 2010, Gensler had met with the top five U.S. banks 13 times, and in 2011, 10 times. That was still more than any other staffer or commissioner at the CFTC. In the year after Wetjen’s appointment, Wetjen aide Reinhart met with the top five banks 36 times, more than anyone else at the CFTC. Wetjen himself met with the top banks second-most often, 34 times. Gensler met them less than half as frequently, as did nearly every other commissioner and staffer, according to the records. In June, Reinhart left the CFTC to join Rosen’s practice at Cleary Gottlieb. One former CFTC official close to Wetjen told Reuters that the commissioner and his aides were simply newcomers studying up on the complex issues facing the CFTC. Bankers say Wetjen gave them a fairer hearing than Gensler. 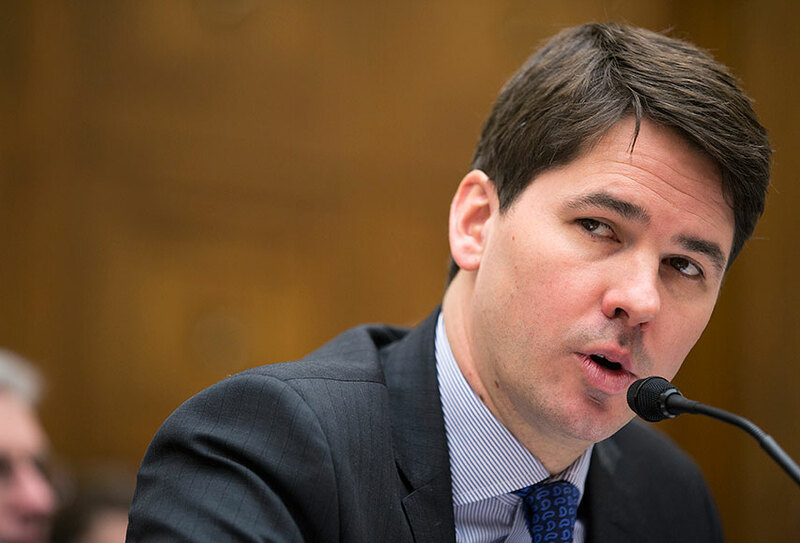 Gensler had little patience for the bank-friendly Wetjen, former CFTC officials say. As their disagreements sharpened, Wetjen’s pro-bank views seemed to harden, these people said. Wetjen joined the CFTC just as the regulator was starting to draft a preliminary version of an important statement that would determine the CFTC’s global reach. The banks were seeking a loophole to trump Gensler’s 17-word insert. They turned to a footnote in an early draft of the policy dealing with cross-border regulation. The footnote referred to banks’ overseas “branches” but not to their “affiliates.” The banks argued that there was a legal distinction between a branch and an affiliate. Therefore, the rules should apply only to overseas branches, and not to overseas affiliates. Gensler shot that argument down. The banks then zeroed in on wording in that first policy draft giving U.S. regulators jurisdiction over banks’ overseas operations that were backed by a parent-company credit guarantee. At the time, virtually all swaps contracts were backed by guarantees that a bank’s parent company in New York would make good on a contract if an overseas affiliate ran into trouble. And so the passage seemed to Gensler a good way of capturing all global swaps trading carried out by U.S. banks. On a call with bank officials in 2012, Rosen, the lobbyist, wondered aloud to his clients: “What happens if you just stop guaranteeing these transactions?” recalled a former bank official who participated in some of the calls. Rosen told Reuters that the idea of de-guaranteeing only came up after the CFTC issued its final policy guidance. Picking up on that idea, banks fought for a narrower definition of the word “guarantee.” The banks seized on a footnote in the final draft, say people familiar with the debate. That passage declared that only “explicit” promises of financial support would count as a guarantee. So, the banks reasoned that if they stripped out the word “guarantee” and equivalent terms, they could avoid the CFTC rules. Goldman had already started moving to restructure its trading operations to get around Dodd-Frank. In March 2012, it sent out a four-page letter to its derivatives clients with an unusual demand. Goldman wanted clients to sign off on giving the bank standing permission to move a client’s swaps trades to different affiliates around the world, whenever and wherever the bank saw fit. Goldman called the letter the “Multi-entity ISDA Master Agreement.” It meant that a client might strike a derivatives deal with Goldman in New York in the morning, and that afternoon, with no disclosure, a Goldman office in London or Singapore or Hong Kong could take over the deal. With each shift, the trade could fall under different regulators. That was a big change. Swaps contracts often run for years, with each party committed to paying the other regularly, according to fluctuations in interest rates or some other benchmark. To a swap buyer, such as a pension fund, or a city issuing bonds, it’s vital to know that the other party will be around to pay up. Editor’s note: Former CFTC commissioner Jill Sommers works for Patomak Global Partners, a financial-industry compliance consultancy. 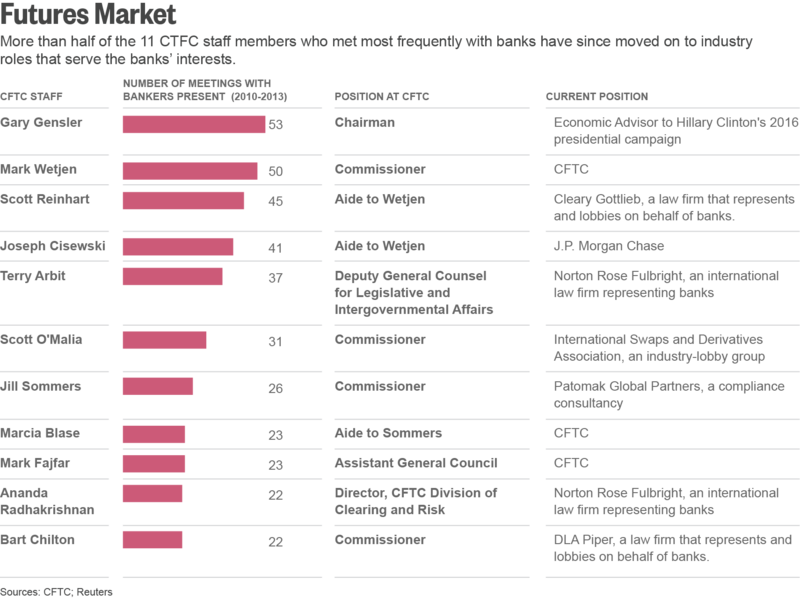 An earlier version of this table incorrectly said she remains at the CFTC. An industry executive familiar with Goldman’s thinking said the agreement was meant to help clients by giving them flexibility to move trades outside U.S. jurisdiction if they wished. “It was an option for those who wanted that flexibility,” this person said. Gensler stepped down from the CFTC at the end of 2013. This April, he was named an economic adviser to Hillary Clinton’s 2016 presidential campaign. Soon after Gensler left, other U.S. banks seized on the gap in the new CFTC policy, according to lawyers and investors. They pressed clients to strip guarantees from hundreds of thousands of swaps contracts. Most went along, say lawyers and investors familiar with the effort. “Banks that de-guaranteed acted in a manner consistent with applicable law and stated agency policy,” said Rosen, the bank lobbyist. By August 2014, U.S. bank participation in certain swaps markets had plummeted. The global inter-dealer market for interest rate swaps in Euros is one of the largest derivatives markets in the world. U.S. banks’ monthly share of the market had plunged nearly 90 percent since January 2013, from over $1 trillion to $125 billion, according to ISDA. The data were misleading. U.S. banks were still trading as vigorously as ever. But their trades, booked through London affiliates, without any credit guarantees linking them back to the U.S., were now showing up in the data as the work of European banks. Executives from several large U.S. banks said they removed guarantees from their contracts because European exchanges, seeking to avoid CFTC jurisdiction, were refusing to let U.S. banks trade. That would cause U.S. banks to lose access to much of the global swaps market, these bank officials said. International clients also threatened to take their business to non-U.S. banks in order to avoid the new American rules, the U.S. bank executives said. “We were worried about our major competitors taking away our access to those markets and clients,” a lawyer for a large U.S. bank said. But premiums paid by clients were largely unaffected, say investors asked to sign the revised contracts. By mid-2014, the five biggest U.S. banks had changed “hundreds of thousands” of such contracts, according to estimates by Michael Beaton, a European derivatives lawyer who works with many international banks. In mid 2014, the Securities Industry and Financial Markets Association, a banking lobby in Washington, circulated a private memo to its members. The memo consisted of talking points banks could use to justify the de-guaranteed contracts and shifting of trades if questioned by regulators and lawmakers. “This practice (of removing guarantees) reduces the perceived transmission of risk to the US financial system,” SIFMA said in the memo. “Based on regulators’ guidance, the termination of U.S. guarantees should be encouraged – not labeled as evasion” of the new derivatives rules. That November, Bank of America notified its clients that, as of November 25, 2014, all swaps conducted in Euros and British sterling would be booked out of the bank’s London affiliate, Merrill Lynch International, according to bank clients who received the notice. A spokesman for Bank of America, William P. Halldin, said the bank didn’t force customers to move trading to the bank’s London affiliates, but did so if clients desired. In early 2014, the CFTC began fielding reports that banks were using the guarantee loophole to move trades abroad. Gensler’s successor, Timothy Massad, a former corporate lawyer and Treasury official with expertise in derivatives, pledged to investigate. This June, Massad announced a proposal that would force U.S. banks’ overseas operations to comply with one slice of American swaps rules – setting aside collateral when trading in a category of swaps. But the guarantee loophole remains, as does the uncertainty that comes with it.